So… I need to set something straight. When training for volleyball… the focus can NOT be (and should NOT be) to win more. That goal, is what keeps most volleyball players/teams/coaches from advancing. They feel SO much pressure on what they are doing and doubt if it's going to help them win more... this usually messes up progress. So much pressure on winning usually distracts from what’s most important. My goal, with any volleyball practice, is skill development. If I can get my players to improve the individual playing skills…then I’ve WON. Shaping is the process of learning a particular skill whereby the coach describes or demonstrates the desired action. Backwards shaping also referred to as reverse shaping is a teaching method whereby the last part in a learning sequence is taught first and mastered. Then the next to the last part is taught next. You are basically teaching the desired sequence in reverse. You aren’t teaching how to do the skill in reverse, you’re just learning the skill from the end point action and shaping the skill from that stage. The goal is to focus on building into the final end point. Eventually the entire action of the skill takes place. It overcomes all the disadvantages of the forward progression method. The learner thinks of the new technique item first and then does what has been done successfully before. 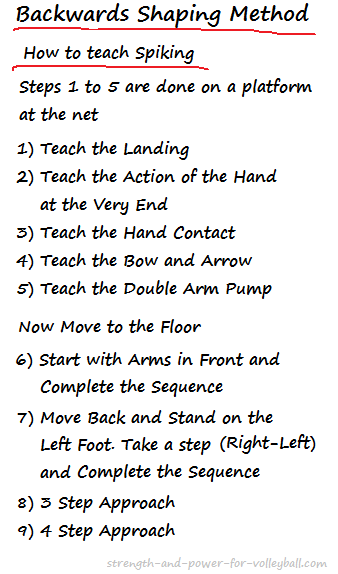 Each progression does not increase in difficulty since undivided attention can be focused on the new step. There is a lack of tension in the learner. Emotional problems do not occur because step sizes are small. The incremental steps are clearly understood by the learner. A high rate of success creates a feeling of accomplishment and self-worth. Only move on to the next step when the current step is performed adequately. Have a recommended minimum criterion for adequacy and it’s better to be too strict than too lenient. If the skill is performed too unsatisfactory, then return to the previous step for further practice. Each practice session should involve a review and practice of all steps. The step sequence for backward shaping will have to be modified according to the attributes of the individual learner and it’s better to have too many steps rather than too few. So, my question for you is – have you implemented this backwards shaping concept yet? 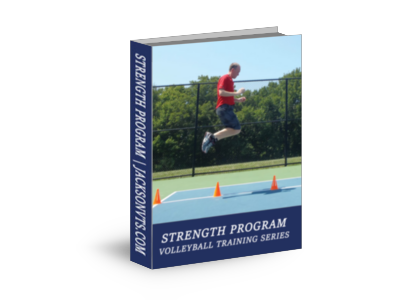 If so – you are well on your way to quickly turning your athletes into the successful volleyball competitors they've always dreamed of becoming. If not – then it’s probably time to get going on this… don’t you think? P.S. I just recently created something REALLY cool - video of me explaining my best volleyball drills. See how you can ACCESS my new coaching videos below.